This week we are going to delve into all aspects of post-fitting rehabilitation. This includes exercises programmes, first-fitting and gait training such as weight bearing and balance, co-ordination and endurance, functional activities and advanced gait training skills. You can see the online version of the week four email here. In the video below Leslie Muller from the ICRC introduces the topics of the week (Note - watching this video is optional). Have a good knowledge about how to don and doff a TT and TF prosthesis and how to teach it to your patients. Have a good understanding on how to manage prosthetic socks during the post-fitting rehabilitation process and how to teach the patient when to add or remove socks. Understand the importance of post-fitting rehabilitation and have a good idea about exercises to improve range of motion, strength, balance, coordination, agility and endurance in order to improve patient's physical and functional status and maximise prosthetic use. Have a good knowledge of gait training exercises, understand their purpose and the importance of a good progression. The aim of this topic is to provide an overview of post-fitting rehabilitation, what type of exercises to use to improve a patient's functional outcomes and enhance all physical demands required for prosthetic use. Much of the post fitting rehabilitation continues with similar exercises to those that we learned about in week three. 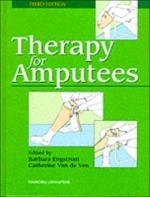 Find out about the overall aims of the post-fitting management of the amputee by reading this page in Physiopedia. Donning a prosthesis refers to the application of a prosthetic device, doffing refers to the act of removing a prosthetic device. The aim of this topic is to gain knowledge of socks and liners and the process of donning and doffing a prosthesis. Prosthetic socks are simple, relatively inexpensive and critically important. Learn why by reading this article. The aim of this topic is to enable you to have a good knowledge about prosthetic rehabilitation including gait training and what type of exercises to propose to your patient to allow him to walk in the most efficient manner possible, to reduce energy expenditure and to correct gait deviations. To start watch this short interview with Dr Robert Gailey where he gives some tips for this phase of rehabilitation (optional). We must understand the importance of gait training. This is a handy article from the Amputee Coalition. You are not assessed on this quiz, it is designed for you to test your knowledge on the topics this week. Let's talk about donning and doffing! In your practice what do you check before donning a prosthesis? What are the important things to educate your clients in when donning and doffing? Tell us about the post-fitting rehabilitation process in your context. What does the process involve? How much time on average does post-fitting rehabilitation take? How often do you see your clients? What factors influence the time taken for rehabilitation? In relation to the video case study, what do you think about the progression in the gait training of Usama? Do you think it is exhaustive? Bragaru, M. et al. Amputees and sports: a systematic review. Sports Med. 2011 Sep 1;41(9):721-40. Alternatively you might be interested in having your own copy of the books. Additionally you might be interested to purchase the complementary DVDs direct from Robert and Ann Gailey. This course textbook has kindly been provided by Elsevier and will be available to all participants of the course for FREE for the duration of the course. Buy with 20% discount by clicking here! !